For an individual who thoroughly enjoys the study of history and having the opportunity to see the role that is plays in modern society, our field trip to Salem, Massachusetts was a fascinating and rewarding experience. It’s often hard to truly feel the history of one’s location, but it was relatively easy to do so in Salem; because of the town’s nature and the layout of the city that exists there today, examples of the town’s long, rich history are around every corner. In countless locations, I saw references to and items from events that occurred hundreds of years ago sitting next to modern establishments, houses, or cars: the historic statues throughout the town, the colonial houses sitting directly on the city street, the school’s mascot being the Salem witches, etc. But of all the historical references I picked up on, the most prominent experience I had in which Salem’s history came to life happened when we toured the House of Seven Gables; during this tour, I learned a lot and felt truly immersed in a location that conveys, in many ways, Salem’s rich history. One of the most notable aspects of Salem’s long history that the House of Seven Gables shows is the city’s fascinating maritime past. I was able to pick up on numerous symbols and examples of Salem’s maritime past throughout the town: a ship carved into the tombstone of a “Master Mariner” in the cemetery, the wharf that we were able to walk out on, and the “Friendship.” But I really felt connected to this aspect of Salem’s history when we were in the House of Seven Gables; this house, as we learned on the tour, was originally owned by John Turner II and, after him, John Turner III. The Turner family made its money off of international trade; they were mariners whose house directly faced Salem Harbor. As I looked out the bedroom window to what had been the Turner’s wharf in the harbor, I really felt as if I had traveled back in time; I could put myself in the shoes of the individuals living in this house hundreds of years ago and imagine what life was like for them. The information that I learned on this tour also helps me better comprehend and relate to the article “To the Farthest Point of the Rich East;” learning about the trade with China and Salem’s role as an international port in the 1700s in terms of an individual’s life helped me understand the information presented in the article. Clearly, the House of Seven Gables and the information I learned there helped me obtain a more involved understanding of Salem’s maritime past; this historical establishment sitting right across the street from modern houses is an example of Salem’s long history coming to life in the current city. Our tour of the House of Seven Gables also provided a lot of information about the everyday life of a member of the upper-class in Salem, and the role that this aspect of society played in literature. When we toured the parlor and learned about the common practices of entertaining company during this time period, I could almost visualize the instruments being played and the people dancing in the parlor hundreds of years ago. 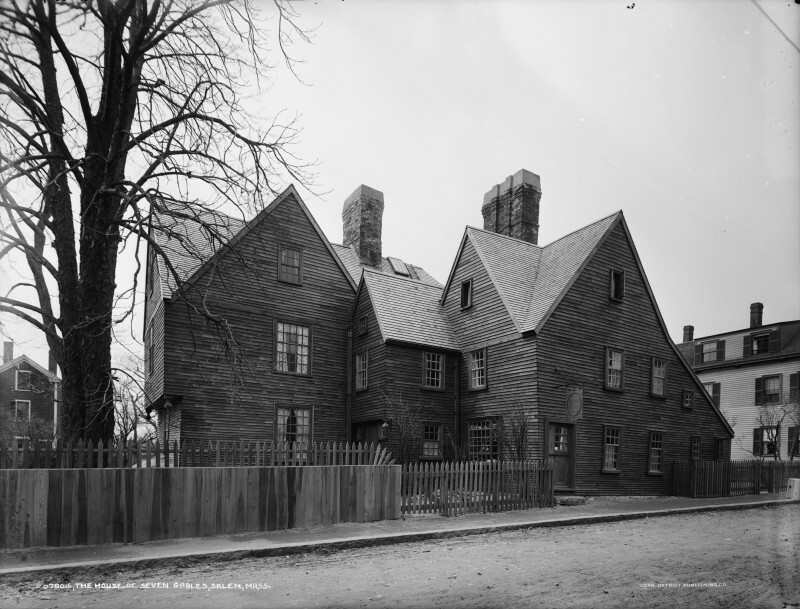 We also gained a lot of information on the impact that this house had on Nathaniel Hawthorne and the references to his novel The House of Seven Gables that can be found in the house, such as the secret staircase. The past and present truly coexist here; even though I was walking through and learning about a house built centuries ago, I saw my peers walking around with cell phones in their hands and cars drive by out the window. The House of Seven Gables, for me, came to life; I had the opportunity to learn a lot about everyday life in Salem hundreds of years ago. Clearly, I feel that our field trip to Salem, Massachusetts was a complete success. It was a unique opportunity for us to physically see what it is we learn about in class: an opportunity we rarely have. It’s such a fascinating experience to look out the window of the restaurant in which you’re having dinner and see a house that was built centuries ago–and be able to learn all about how and why it was built! Salem’s impactful role as a port and as a city is conveyed in a number of locations throughout the town, and the history truly comes to life. I hope students for years to come have the opportunity to go on this rewarding, educational, and fun trip. Abigail Goldfarb is a junior at Voorheesville, and loves to write! In her free time, she participates in a number of different clubs and sports at Voorheesville including Model UN, Science Olympiad, Drama Club, Key Club, National Honors Society, Varsity Cross Country, and Varsity Track and Field.